A figure European legend that is still seen commonly on the logo of a coffee chain, Melusine is an update of previous Mel- names with a deep root in history. Melusine (pronounced: mel-U-si-ne or mel-U-seen) is a feminine spirit of fresh waters in Folklore and appears much like a mermaid with wings. Most commonly used as a heraldic symbol rather than a name is of Germanic origin meaning “hard worker”. The story of Melusine starts in fact with her mother Pressyne was come upon by the King of Albany who was persuaded to marry him as long as he didn’t look upon her as she birthed or bathed their children. She would go onto to birth triplets, Melusine being the oldest. The King broke his promise and Pressyne fled the Kingdom, taking her daughters with her to Avalon. Melusine would later seek revenge on her father for his broken promise and locked him in a mountain. Her mother was furious and condemned her that every Saturday she would take the form of a serpent or mermaid (depending on the rendition). Later on, Raymond of Poitou came upon Melusine and proposed marriage which she accepted with conditions. He broke the promise and saw her as part-serpent/mermaid. He would later expose this in front of his court in which she took on the form of a dragon and flew away. Melusine can be seen as bit of a dark figure but I personally don’t see it that way. She is a choice that fits along with other mermaid like names and those of mythology easily. The heraldic image of Melusine is found on the logo of Starbucks Coffee chain. The legend of Melusine is also heavily ingrained in the Philippa Gregory novel ‘The White Queen’ and its adaptation of the same name. The story centers itself around Elizabeth Woodville who was Queen of England to King Edward IV who in the novel is supposedly descended from Melusine through her mother’s line. Over variations of the name include Melusina and Melisande. None of the three variations have ever been popular in the US, with the three names not having recordings of any births. 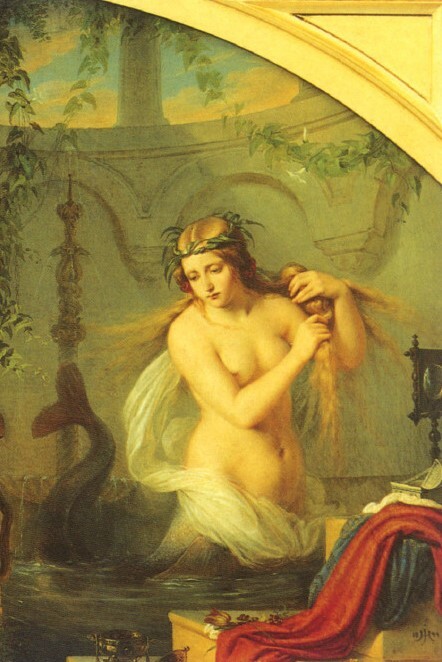 Though the stats show 5 and above births for the year, it could be possible that there is a Melusine out their somewhere in the states it is unlikely though in Europe I would suggest that it has been used though sparingly. It makes for an interesting choice and would fit alongside other mythological names like Penelope and Cassandra as well as fitting alongside other aquatic based names. This seems to be the character Melisandre in A song of Ice and Fire is based on. They are both magic-users connected to a king and have a mysterious behaviour, and the names Melisande and Melisandre are almost identical.